SequenceHDP is inspired by the elegant Varana stone found in the Emilia Romagna region of Italy. With its light grey coloration, small compact granules and contrasting wave-like veining, Varana stone is the material of choice on altars and baptismal fonts throughout that area. 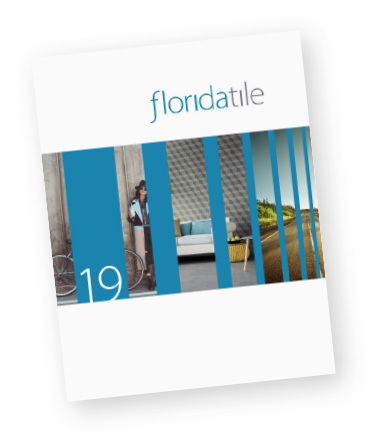 Florida Tile’s unique interpretation of this stone, SequenceHDP brings versatile color and size options in a color body glazed porcelain tile that realizes an ideal palette for designers. The tone-on-tone veining in SequenceHDP allows for beautiful shade variations in each of its four color choices: Breeze, a light dove tone with waves of a neutral beige; Drift, a warm taupe accentuated with darker greys and browns; Current, a medium grey with steel blue-grey delineations; and Vortex, a dark slate grey with black graphic effects. Available in three rectified large-format sizes: 12x24, 24x24 and 18x36; and a rectified plank 9x36, all feature a soft, flat surface and rectified edges allowing for tight, nearly seamless installations. Complementing the field tile are two mosaics; the first is a herringbone pattern made of 1x3 strips that give the product an upscale look commonly found in natural stone. The other is an oversized 4” hexagon pattern; both designs are mesh-mounted and sized at 12x12. Completing the collection is a 3x24 bullnose trim. Both the mosaics and bullnose are available in all four collection colors. As part of Florida Tile’s newest innovation in product development, SequenceHDP incorporates Microban® antimicrobial technology into the tile surface. Manufactured using proprietary HDP—High Definition Porcelain® printing technology and with the technical performance of porcelain, the SequenceHDP collection is appropriate for all applications in both residential and commercial settings. It is entirely made in the USA in our Green Squared® certified, Advanced Manufacturing Center in Lawrenceburg, KY of 40% pre-consumer recycled content. It meets the DCOF AcuTest® requirements to be installed in wet areas and is GREENGUARD® and Porcelain Tile certified.